^ a b c d e f Newman, William R.. “Abū Mūsā Jābir ibn Ḥayyān”. Encyclopædia Britannica Online. http://www.britannica.com/eb/article-9043128/Abu-Musa-Jabir-ibn-Hayyan 2018年11月22日閲覧。. ^ a b c d e f g h i j k l m n Glick, Thomas F.; Livesey, Steven John; Wallis, Faith (2005). 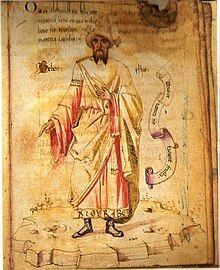 “Jabir ibn Hayyan (Geber)”. Medieval Science, Technology, and Medicine: An Encyclopedia. Psychology Press. ISBN 9780415969307. https://books.google.com/books?id=SaJlbWK_-FcC 2018年6月8日閲覧。. ^ "Jābir Ibn Hayy." Complete Dictionary of Scientific Biography. . Encyclopedia.com. 21 Nov. 2018 <https://www.encyclopedia.com>. ^ Corbin 1998, p. 45. Holmyard, Eric John (1931). Makers of chemistry. The Clarendon press. http://books.google.com/?id=NZcaAAAAIAAJ 2010年6月19日閲覧。. Richard Russell (1928). Holmyard, E.J.. ed. The Works of Geber. ISBN 0-7661-0015-4. Nasr, S.N. (1975). Life Sciences, Alchemy and Medicine (Cambridge: The Cambridge History of Iran) 4. Corbin, Henry (1998). The Voyage and the Messenger: Iran and Philosophy. North Atlantic Books.